We have had some great days at home so far. Saoirse is playing and laughing again, and enjoying "running" around the house, dragging us along all the way. The only downside so far is that she is having some trouble sleeping. She is normally a great sleeper, and gets quite mad when she doesn't get enough rest, but recently she has been having a lot of trouble getting to sleep and staying asleep. It has made for some very frustrating 2 am battles, and some very uncomfortable sleeping in our bed for Mike (she doesn't seem to like to sleep on me; apparently I'm not comfortable). One thing we are considering is that the pain medicine she is on (oxycodone) is keeping her from falling asleep at night and therefore making her night waking worse. I think tomorrow we will try not giving it to her right before bed. I have asked the doctors about using homeopathic camomile (usually used for teething) to help her calm down and sleep at night. They are supposedly looking it up for me to make sure it doesn't have any interactions with her other medications. Hopefully that will help her some. I really feel like she's less in pain and more just off schedule and feeling clingy. We had our first clinic day at the Jimmy Fund Clinic. Saoirse will be doing most of her outpatient care here. The facility is nice, and they have a lot of fun stuff for the kids. It's a very happy environment and it's nice to see the kids happy and playing while they are there. We met with the nurses and doctors that will be following her from now on, and we started getting her schedule together. It's going to be a bit crazy, but they are happy with her response to treatment so far. 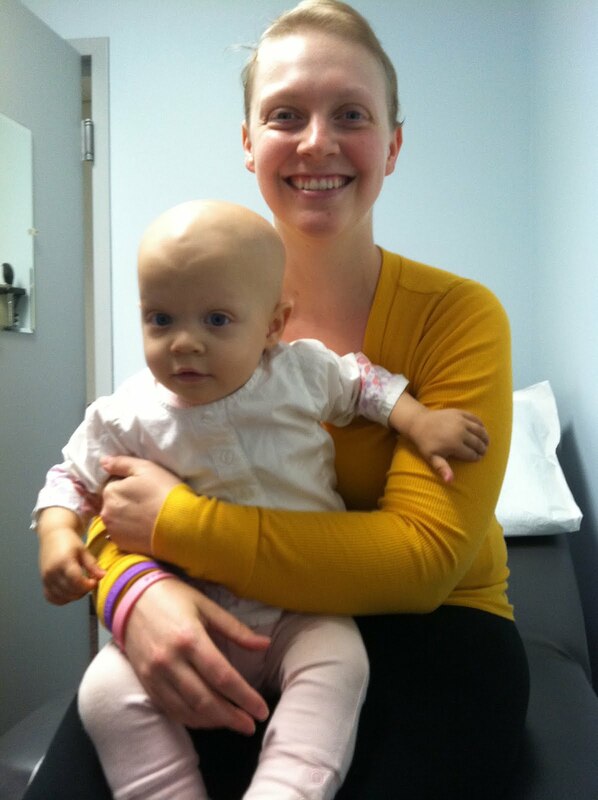 We got some of the results back from the biological testing on Saoirse's tumors today. We had hoped that she would be in an intermediate risk category, however she does have the genetic "NMIC" factor that means that her tumors are more aggressive and will need more aggressive treatment. Her next round of chemo will be over 5 days, and her treatments will be 3 - 5 days every 3 weeks. She will eventually have to have what is called "stem cell rescue" which takes her own stem cells from her bone marrow, and returns them to her after some intensive chemotherapy. Everyone is still very positive about her prognosis and say that her age is still her best asset against the disease. She is showing so much improvement already, that we can't wait to see how much she improves after her next cycle. Balancing the meds for the side effects seems to be the most difficult right now, but I'm sure we will get that figured out at some point. No matter what, we are sharing a lot of love and that is what is the most important. Hi Kezia: I signed up for the Meal Train. It will be scrumptious! I am thinking about your fight everyday and sending positive thoughts your way. It keeps my very grounded. When things get rough on the homefront, I just think about how strong you have continued to be through this whole process. Happy thoughts to you and your family! Thanks for posting all this -- I am so glad to know how things are going. I am going to sign up for the MEal Train now... Where is the Outpatien Jimmy Fund Clinic? How far do you have to go for that?